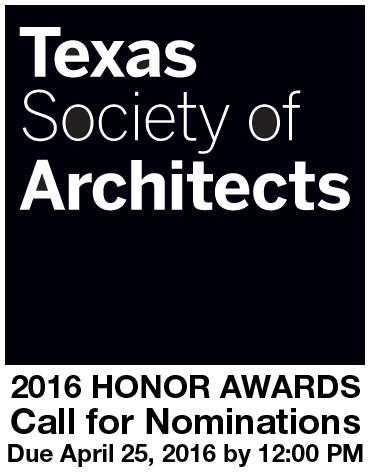 AIA Dallas is looking for your suggestions for the Chapter's nominations for Texas Society of Architects Honor Awards. The Community Honors Committee works hard every year to advocate for the individuals and groups who are promoting, improving, and expanding our profession. We nominate and create the submission packets for awards given out by Texas Society of Architects (TxA), AIA National, and by our local Chapter. It is a role we take seriously and we strive to think outside of the box to recognize all of those who are having a meaningful impact on our community. Established in 1996 the Architecture Firm Award is presented to a Texas firm that has consistently produced distinguished architecture and has contributed significantly to the profession and the community for a period of at least ten (10) years. This award is the highest honor the Texas Society of Architects can confer upon an architectural firm. The Medal for Lifetime Achievement is awarded to a member in recognition of a lifetime of distinguished leadership and dedication to architecture, the profession and to the community. The medal is the Texas Society of Architects' highest honor, awarded in memory of Llewellyn W. Pitts, FAIA, to publicly recognize architects, who by their example and service have made significant contributions to the advancement of the profession and service to the community. The Texas Society of Architects' Award for Young Professional Achievement is awarded to an architect member who has shown exceptional leadership and made significant contributions to the professional in the early stage of their architectural career. The Texas Society of Architects' Award for Community Service recognizes an individual member, component or architecture firm for an extended commitment to the community service and/or significant contributions to the community evidenced in a positive impact on urban, environmental or neighborhood issues. The Texas Society of Architects' Award for Outstanding Educational Contributions recognizes an individual architectural educator for outstanding educational contributions. Texas Society of Architects' Associate Member of the Year Award is presented to an Associate AIA member who best exemplifies the highest qualities of leadership and has demonstrated an unparalleled commitment to their local component or Texas' membership, through service to the profession, and/or in the community. Awarded to a member or a Texas Component for developing unique programming for the successful development of or extraordinary effort to mentor and promote the advancement of Associate AIA Members in their local AIA component or the state component, Texas Society of Architects. Honorary Membership in the Texas Society of Architects is one of the highest honors the Society can bestow upon a person outside the profession of architecture, and is awarded to an individual for their long-term association with architects, architecture, or allied professions in providing a better quality of life in Texas. Honorary Membership is awarded for accomplishments of the nominee, which are truly outstanding and of statewide significance. The Citation of Honor is awarded to individuals, groups or organizations outside the profession whose activities make significant contributions in supporting the creation of safe, beautiful, sustainable environments in Texas. The Texas Society of Architects' Artisan Award is presented to individuals, groups or organizations outside the profession whose artistry, talent, technique, diligence, creative insight and collaborative nature support the creation of safe, beautiful, sustainable environments and make significant contributions to the built and natural environment in Texas. If you know a person, firm or organization that meets the award qualifications above please let us know. We want the opportunity to acknowledge these people for the incredible work they do and for the strong impact they have.